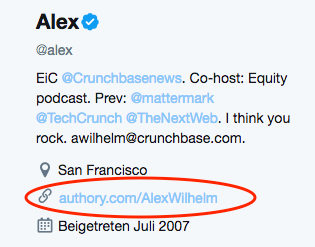 On your public Authory page, people can subscribe to your profile via email with a single click. No registration required. Letting your followers on Twitter, Facebook or LinkedIn know how they can easily follow your new articles goes a long way. Ideally, you let them know about Authory at regular intervals, eg. once per week. We recommend mentioning the main benefit of becoming an email subscriber, e.g. "You can now follow all my new articles, regardless of where they are published: authory.com/FirstnameLastname"
That's an easy one, yet it's very effective: Link your Authory page from your Twitter, FB and LinkedIn profile. Anybody who wants to find more information about you will then be directed to your Authory page. Not only will she find all of your articles there, but will also get the chance to become an email subscriber with a single click. Say you already have a list of people that you (sometimes) send your new articles to. Or maybe you've tried your hand at creating a curated newsletter in the past and still have some emails from that. We can import these existing subscribers for you, free of charge. Once imported to Authory, all these people will be reliably notified about your new articles. Simply let me know if this is of interest to you and I'll tell you how it works: [email protected]. Please remember to add the contacts in the BCC field because you probably don't want recipients to see the email addresses of everybody else.